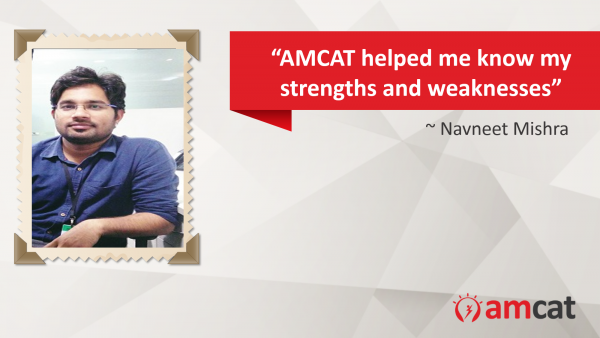 Hear how the AMCAT test helped Navneet grab his dream job - one of the many success stories of the test. 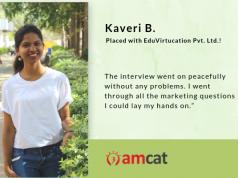 Meet Navneet Mishra, a graduate from Shri Ram Murti Smarak College of Engineering & Technology and know how he managed to kick-start his career just by giving AMCAT. Hi, My name is Navneet Mishra and I am from Varanasi. My goal is to work in a reputed MNC. I came to Bangalore to get a good job but it turned out to be very difficult. I gave many interviews but hardly got anything. AMCAT is a versatile test, it includes questions from almost all parts i.e. aptitude, reasoning, core subjects, English. I got to know my strengths and weaknesses through AMCAT. It helped me a lot to get a good job. 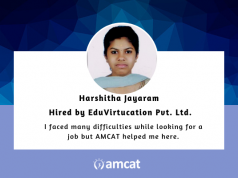 Q: Would you suggest whether other job seekers should take the AMCAT? If yes, why. Yes, It is the best way to filter yourself from the crowd. Crack AMCAT with a good score. It will definitely enhance your chances of getting a job in a reputed MNC. Enthused by Navneet’s success? 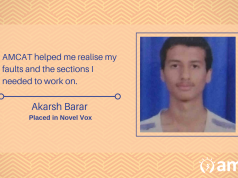 He is not the only one, read more of our success stories and know how AMCAT brought them a step closer to their dream job.